Bordeaux has countless châteaux – 7,196 to be exact. How do you even choose when there are so many options? Our quest to discover the best, and when we say best we mean not only wine but also wine tourism – led us to Château Saint Ahon in the Médoc. Perhaps you’ve heard of Montesquieu? He lived during the Age of Enlightenment, a period of time in the 18th century when an intellectual and political movement that modernized Europe. Montesquieu was born here in the Aquitaine region, not far from Bordeaux. He was best known as the founding father of sociology. You might ask why I am giving you a bit of a French history lesson. It’s because our very own world famous Montesquieu was the owner of Château Saint Ahon in the 18th century. Unfortunately, the château was destroyed during the French Revolution. It was reconstructed under Napoleon and restored in 1875. 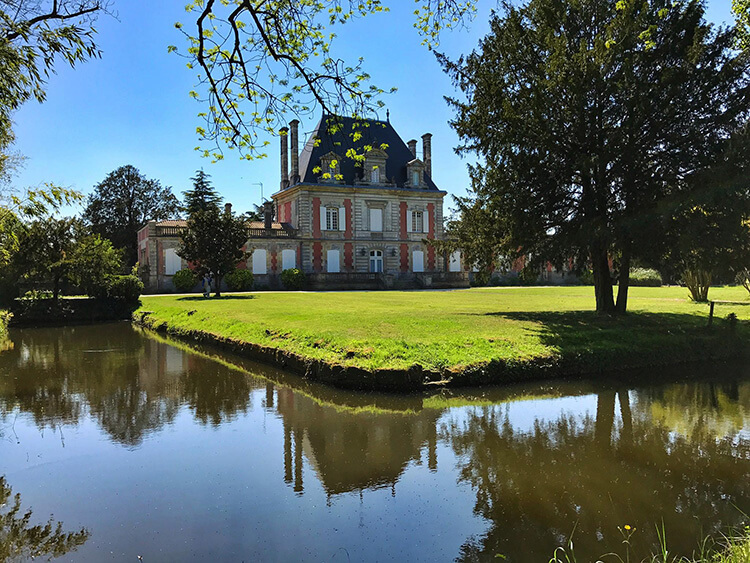 Just 20 minutes outside of Bordeaux in the community of Blanquefort, the château is now listed as a “Remarkable Monument”. The château had a long history of owners, with the Count and Countess Bernard de Colbert becoming the 67th owners in 1985. It’s been a family run affair ever since, with the Count and Countess’ daughter and son-in-law joining the family wine estate business in 2003. Château Saint Ahon is now one of the last wine estates in Blanquefort. You might have also heard of the famous 1855 Classification. It was created under Napoleon as a way to collect all the products that make France famous. For many political reasons at the time, all of Bordeaux’s “best” red wines were selected from the Médoc, though not all châteaux from the Médoc were included. The 1855 Classification is historic and has never been revised, with one exception: Château Mouton Rothschild was able to improve their classification from a second growth to a first growth in 1973. Cru Bourgeois is a classification created in 1932 essentially to include châteaux that were not included in the 1855 Classification. Though not as high quality as the Classed Growths, Cru Bourgeois is still a high quality wine. The classification was annulled by a French court in 2007 and thereafter all use of the term “Cru Bourgeois” was banned. The classification was significantly reformed and was once again introduced in 2010. Though, unlike the 1855 Classification, Cru Bourgeois is awarded each year. It takes about two years from the vintage for Cru Bourgeois to publish the classification for that vintage. So when it was reintroduced in 2010, it applied to the wines made from the grapes harvest in 2008 – otherwise known as the 2008 vintage. Château Saint Ahon has been the proud recipient of the Cru Bourgeois classification every year since 2009. Château Saint Ahon also opened their winery and barrel room to visitors in 2009. The guided tour, which is available in English or French, takes visitors through their process of sustainable farming, the wine making and aging processes. Of course, the visit ends with the best part: tasting Château Saint Ahon’s wines. And if you’ve brought the kids along, they won’t be left out. They get grape juice to enjoy. There’s also a small boutique where can purchase vintages from several years, as well as local products from nearby producers like honey and marmalade. Our favorite part, aside from the wine tasting, was the visit to the Mirabel Gardens. It’s a looping discovery trail you follow for about 1 kilometer that winds through the vineyards, around the stately château and through the woods. There’s explanation panels in both French and English full of interesting information about Bordeaux, Cru Bourgeois, the wine making process and even the oak trees and barrel making process. Each panel has a QR code that you can scan with your phone to get even more information. With the ducks, goats, mascot donkey and horses, there’s plenty to keep kids entertained. There’s even a playground where they can burn off energy, so it’s apparent Château Saint Ahon definitely designed their visits with family in mind. Château Saint Ahon can be reached easily from Bordeaux center on public transportation. You can take bus Line 29 from Quinconces Orléans directly to the Terrefort stop, which takes 55 minutes and runs every 30 minutes. You just have a short 500 meter walk from the bus stop to the château. Alternatively, you can take tram Line C to Gare de Blanquefort and then change to the Line 29 bus, taking the bus to Terrefort. It costs €1.60 each way on public transportation. Download the TBM app to easily navigate Bordeaux’s public transportation network. Guided visits are available all year round, except Sundays. An appointment is required, which you make online. Visits are €7.50 per adult, €4.50 per child (children 3 years of age and under are free) or €20 for a family of four. Visits are discounted to €3.50 with your Bordeaux Metropole City Pass. The Bordeaux Metropole City Pass gives you free entry to 8 museums (including La Cité du Vin), 7 monuments, a guided tour of your choice in Bordeaux center and unlimited use of Bordeaux’s public transportation network. There are also additional discounts and special offers at many other attractions, including Château Pape Clement. Visits are discounted to €3.50 with your Bordeaux Metropole City Pass. This article contains affiliate links. When you book on Viator through our affiliate site, we earn a small commission at no additional cost to you. This looks absolutely amazing.We have yet to get to the region and as you said, how do you possible choose with 7,000+ options?! But i love the looks of this one, the tour, gardens, etc so it has vaulted to the top. Thank you! I love visiting French Chateaux – it’s actually one of my experiences of France – we went camping in the Loire Valley when I was a kid. I don’t think they were quite so child friendly though in those days! France has so many and diverse châteaux. Really incredible. Comes with no surprise that Bordeaux alone has more than 7000! I’d visit for the building itself and the gardens. Not big into wine but love to find out how they make it and everything around it. Wow, really lovely. I’m also shocked, like Hugo, about 7,196 different chateaux in one region. Amazing. I have yet to make it to Bordeaux but will add this to my to do list! 🙂 Also love the hiking option! Looks like you enjoyed a lovely visit to this charming Château Saint Ahon! There are so many gorgeous estates in France that I’d love to see. Thanks for highlighting why this one should be on my list. Beautiful Chateau, concrete tanks, lovely rose, an educational vineyard tour and ducks! What more could you want. Oh that\\\’s sweet that they give the kiddos grape juice! I feel like children love to be included when adults are having fun. Looks like a great time! Nice Châteaux. But how can you even choose from 7000 of them and this is just in Bordeaux? Crazy! Crazy beautiful. Ahhh, stop it! There is something about hanging out in a french chateaux, especially one with a massive wine cellar. We haven’t done Bordeaux but we did spend a week in a chateau in Normandy for a friends wedding a few years ago and had the fattest time. This totally makes me want to head back! Ok, so I’m a huge history buff. AND I studied sociology. So my interest was already piqued, but knowing that there’s wine too just sealed the deal! lol! I would love to visit Château Saint Ahon and take a tour of the winery.